Here is another organization that is doing a great job with the design of their website. Today, we’re featuring Knott Avenue Christian Church. Located in Anaheim, CA, KACC’s mission is a four-fold life purpose to connect with God, believers, serving, and unbelievers. The Custom Pro Website package that they have with OurChurch.Com has helped them achieve this mission. Information about the church and ministries, as well as interactive areas like online sermons and prayer requests have all been a key part of their online ministry. In addition, they are now receiving more visitors to their website than ever before due to the top 10 search engine rankings service included in their package. Take a look at this video in which the KACC staff share their thoughts on their website. If you’d like to talk with some at OurChurch.Com about web design options that can help you better achieve your mission online, read more about our web design services and request a free phone consultation. 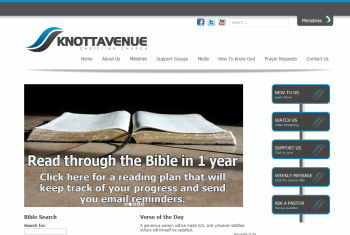 What do you think about the design of the Knott Avenue Christian Church website and how it’s helping them achieve their mission online?